The Infinity VPS V (OFF) with the brand new VPS technology (Veneer Precision System) is built with two hand-selected middle veneers that are treated with a unique and exact heating and cooling process with precisely measured time and temperature. The Diamond Touch technology gives the outer veneers extra hardness and the surface an incredibly smooth finish and combined with the VPS technology the result is an offensive lightweight blade with outstanding solid touch and feeling. Infinity VPS V gives you the possibility to master the key elements in today’s modern game: aggressive receives which help you gain the upper hand at an early stage, and the possibility to follow up with powerful and aggressive topspin shots. Developed together with top players from the Chinese National Team, the Infinity VPS V suits the more offensive minded player with powerful topspin strokes! Made in Sweden. I would highly recommend this blade. I agree with all the good things that were mentioned about this blade. What's even better is the service that you are getting with Tabletennis11. Free lacquering, fast shipment and I got the specified blade weight. I receive the order in 4 days with no shipping charge. Kudos to Tabletennis11! After reading many reviewsб I decided to give this blade a try. Bought it here with lacquering (I read many times this has to be a must) and rubbers assembling service (Yasaka Mark V HPS soft on fh and Donic Bluefire M2 on bh), which was excellent. After a week trainingб I changed the fh rubber to Rakza 7 which fits better my playing style, the HPS soft is a bit slow to me. So well, now I'm still dealing with the feel of the blade. Although I like the way it performs increasing my aggressive but controlled playing style a couple of mm over the netб I'm still struggling with the whole feel and sound of this blade, which I personally don't like much. But yeah, this is a matter of personal taste. Except for this, I'm happy with it. Very fast blade, but a little too heavy and as a result, control suffered. I found this blade to be perfect for driving close to the table and looping far away. Since I'm a more powerful hitter I found this to allow me to hit even harder while still being able to control the ball compared to my DHS blade. Very good control and feeling, I cant replace with another blade. I bought one 93gr. Need to have more active game. Like feeling and sensitivity of this blade. I don't know how to begin this review. This blade is perfect, basically. You can't go wrong with it. 5 layers of beautiful control and feeling, but craving for power to unleash. It is so versatile, that I even tried it with one of our guys at the club WITH PIMPLES! Yeap, he moved from Timo ZLC to this, now he's blocking basically anything we throw at him. For attackers, the speed is there, when you hit it right. It is a wonderful blade. My hands are medium-large for American standards, so I if that's your case, go for the Legend handle. Enjoy this babe! I bought my second infinity VPS V. Yes, I have two of these. I love this blade. It’s fast but have good control. Feeling is appropriate. It’s an excellent option for pimples players because its outer wood is hard. It’s great so fan zedhong uses it. Best all wood blade that I've ever used. Used with Bluestorm Z1 rubbers and now with Nittaku G-1's. 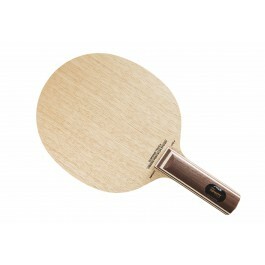 Great wood blade for fast and spinny rubbers while maintaining lots of control. Everything is above average. Hard woody blade. Medium to low throw angle. Especially joint Limba used which is no expected in this price range. Good blade, hard feeling, speedy. But quality of outer layer doesn't satisfy me which is built from jointed Limba. It is expected to be jointless. and vega japan for BH. I bought this for my friend, he likes it, I don't; heavy blade with thick handle, I believe it takes getting used to. Medium speed and excellent control makes this the best blade for me (so far), playing an allround attacking play mostly near the table. Away from the table it lacks a bit in power, especially compared to carbon blades. I prefer the straight handle to the legendary because the legendary feels like it hinders my wrist a little (I have medium sized hands). First blade got some splintering when changing rubbers so second one I had lacquered by tt11 (excellent service). Still, you have to be really careful when removing rubbers. And I agree with all comments about the sharp edges, you probably need to sand them down. In summary, a great blade, especially regarding control. Some quality issues with splintering and sharp edges that I choose to ignore because the feeling when playing is simply excellent. I have played with several Stiga blades (offensive cr, maplewood nct, intensity). Infinity is slightly faster and much stiffer than intensity. Despite how hard the blade is, I was really surprised at its great dwell time. 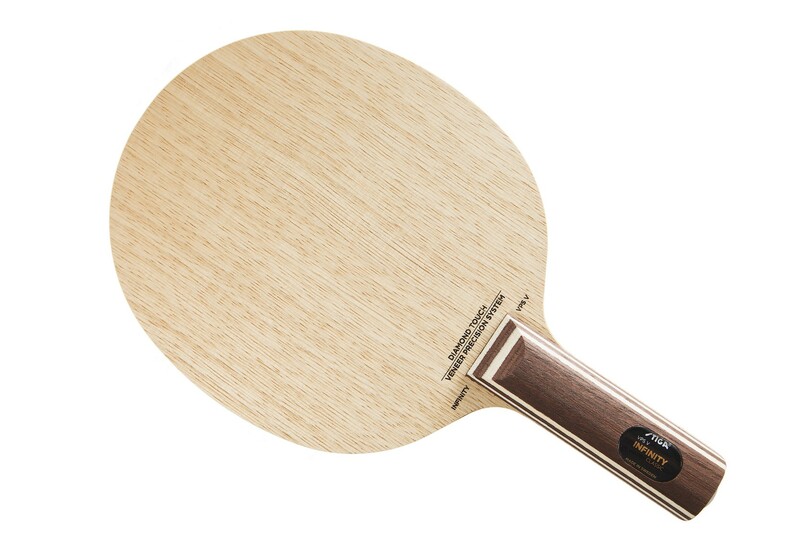 I use hard Chinese rubber Skyline 3 (1.8mm) on forehand, the ball still stays on the paddle for very long time, allowing for a lot of adjustment time during rallies. Looping is super easy due to the long dwell time. The flare handle and weight are just right. I read some reviews that said this blade is too heavy, so I'm glad it turned out ok. I highly recommend this blade to topspin players of all skill levels. I own a Viscaria, Timo boll spirit, Clipper CR and have played with a lot of other setups. My level is about 1900 US. I ordered two Stiga Infinity VPS V blades. One was a bit heavier than the other, 92g vs 86g. I found the heavier one to be more solid and very effortless in terms of power ( especially away from the table). I really liked it except it was too heavy. As for the lighter one I was sure it was going to be a perfect blend. Unfortunately that was not the case it seemed quite the opposite. In summary, I think everyone has different preferences. I feel that this blade is quite good in general. I personally did not enjoy the balance of this blade. I thought the heavy bat had a good solid feel and was powerful but was too heavy. I also thought the light bat was fairly decent but compared to my other setups which actually weighed less, this one felt heavier in the hand. I feel it is a good blade because it has decent touch, good control, speed and power. My personal opinion is the balance of the blade is not optimal. Arrived in perfect condition. I would definitely recommend having tabletennis11 assemble your blade. They do it perfectly. Gran blade es el mejor que he tenido, un gran feeling, una gran calidad de la madera realmente un peso promedio, sin embargo me da el soporte necesario para darle la potencia a mi rubber con un buen control. If you like a lot of vibration/feedback then it may be for you. I have not seen this aspect of the blade written at many places so I want to let others know that this is a core aspect of this blade. Tabletennis11 is awesome as always. I got one ST and one FL from them when this was on sale. Both were around 98grams. Beware of sale items I guess and need to ask specifically the weight when buying sale items. Excelente raquete, rápida e com controle, pena que vibra um pouco, porem ótima raquete. With proper techniques and good rubber combinations this blade will perform more than one can expect. Quality is top notch, no splintering so far, light in feel, very good short ball play, explosive spin. Not too fast but not slow, very good flex and control. its hard, hard feel when I transferred from avalox series. I cannot believe Fan zhendong using this to do his BH in-table flip. I cannot simply return one! Its so hard feeling that short ball BH flip is just impossible to me. The Infinity had just the right mix between speed and control. The blade has a wonderful woody feeling. I eventualy bought a second one. It's a quality blade. If you have a big hand, don't hesitate to pick up the Legend handle. My hand is big, and the Master handle is a bit thin and 'spiky'. This is excellent Order and Excellent Product! Very quick and professional Service delivery! Topspin feeling is like hitting the rubber ball. Sweet spot sound is.. "Tong...Tong..". I've only played with it a couple of times. I will probably come back to review it some more. Right away I've noticed it to be very light and the wood provides good feeling when spinning or hitting the ball. The quality is not so good (especially the top wooden sheet). If you attach and detach rubbers quite often you will need to buy a new one soon. Generally it is a nice fast light weight blade with exceptional control. So for me it is best value for money. My coach uses this blade in penholder style and he has excellent control! In terms of the blade itself, physically, I took the precaution of lacquering it several times (water-based lacquer) as I do enjoy trying different rubbers and carrying out my own comparisons. The surface is not as smooth as the Eternity VPS. I currently use Tenergy 05 and Tenergy 80 on this blade and the balance between speed/control/spin is pretty good - not perfect, but I am happy with it. One bug bear with Stiga is the sharp edges - would it kill them to gently sand them down? Obviously, I did that myself. The blade is nice and light and has a good feel to it. I have compared quite a few blade/rubber combinations and I chose this after trying the Stiga Genesis soft rubbers on my Stiga Eternity VPS blade - overall effect for me was just too dead. I don't want for speed with the Infinity VPS but having said that I am still experimenting with rubbers for my Eternity blade! It feels like an OFF blade and depending on the rubbers you choose could even feel like an OFF- blade. Good body technique is needed to ramp up the speed of this blade - I cannot afford to use "lazy" strokes and hope for the rubbers to provide the speed. I see that as a good thing since that illustrates the good control offered by this blade. With the Infinity VPS I am happy to try any shot type and pretty confident that any subsequent failure to execute is down to me and not the bat! It has everything: power, control, feel and spin. Reccomended. speed between off- and off. nice blade. The bat is light and may feel a bit head heavy with different rubbers. Otherwise, this is a very good choice for developing players to master their shots. Very good control and wooden feel. The legend handle is extremely comfortable. A deal for the price! Good blade for me and I have ever get perfect looping with this. Also speed enough for me. Started playing with this blade about a year ago, and I really like the balance b/n stiffness, feel, and control. I have Evolution MX-P on both sides, and this thing really does it for me. For an all wood blade it is impressive. When you want to play full offence this blade produces good spin because of its dwell time. Just make sure you put a med-hard rubber. I used Tibhar MX-P on it and normally this rubber by design is a speed devil, bounce immediately. The flexibility of wood makes the ball spin with the proper stroke, do more drills and on the same session uou will feel ita full potential. Control 9, Spin 8, Speed 8, Dwell 9, Hardness-Medium. Best combo with 42-48deg rubbers Good for blocking, long rally, and looping. Blade for allround to offensive players. One of the nice all blades. Control and looping are good. Legend handle feels very good at hand. Its a good and fast blade with neat sound and decent amount of control. I like it. will use it for another year at least. This is a great all wood 5ply blade with decent speed (true off) and control. I own a few of them and all are bit different to each other even being almost the same weight. The blade has average to little vibration and high throw. The sweet spot is average and not that big as claimed by Stiga. But even though I like this blade very much. It doesn't excels in every aspect but still very good in all. For the price it's a deal. I play Tenergy 05/05 FX and it fits great. I played Tibhar Mx-p and it worked great as well. The feel that blade gives you is awesome. BUT I want to make it clear: the playing properties of this blade are impressive but the quality is not that great. Be extremely careful when taking the rubber off. Look not to take the wood layer off :-) And I also had troubles when gluing the rubber - the glue dries out immediately so it's hard to apply it properly to the blade (I used butterfly Freechack 1 and 2). This blade is one of the best blades i have ever played with. Very nice feeling, enough speed and good control. This is a great blade for looping - somewhat stiff with a med-hard feel. Its sweet spot is HUGE and it has amazing control. The pace I feel is good enough paired with a faster rubber. Just make sure to get it sealed and you may want to shave down the "wings" so that it doesn't dig into your hand. The handle was also fairly rough, but smoothed out over the weeks playing with it. A little soft for a pen hold hitter, but works great for loopers. This is my first and only all-wood blade. Comparing to zjk zlc blade I was using, it feels almost the same. IMHO this is a balanced blade and it is not picky about the rubbers. I tried two set ups, FH-Rakza 7/BH-Tenergy05 and FH-Omega VI Euro/BH-Rakza X. They both work great for my style. However, I had to sand the blade handle to make it comfortable for holding. It is light, stiff and hard. It feels hollow but it plays very good, especially close to the table. It has enough power for close to mid distance play and it's not bouncy on slow shots so it's much better at short game than most blades with that speed. It has high throw. Rakza 7 2.0 Soft on BH suits me perfectly. Rakza 7 2.0 on FH is good but I think there are better options for my game. First, I got the exact requested weight. Second, I chose free lacquering and upon receiving the blade I wasn't sure if my blade was lacquered (I am inexperienced with it) so I asked a question on some other forum and they (tabletennis11) have read that post and contacted me(!) and after double checking with their stuff they confirmed everything was ok and offered me further assistance if needed. You don't see that level of customer care often. Very beautiful and the best 5-ply wood blade I've ever used. Just like other people have mentioned, this blade has very good feel and is great for close to mid distance plays. The rubbers I've tried include Yasaka R7 (FH), Tibhar MX-P (FH), XIOM Vega Pro (BH), and Andro Rasant (BH). The hardness of these rubbers ranges from 34-37' degree. They'll perform very well on VPS. The spin is amazing, especially MX-P and Vega Pro. Serves are short and spiny. Top spins are fast and powerful. The only downside is that, VPS lacks a little bit of power when paired with softer rubbers and playing far from the table. It also looses wood fibers easily. So be careful when removing the rubbers. Overall, VPS is a really good blade and I even purchased a second one for backup. Thanks tt11's good service! This blade is light yet very powerful! Paired with H3Neo on FH and Acuda S2 on BH. Only just tested the configuration and initial sensations are favorable. Good spin and control, minimal vibration, nice feel. Controllable power. An outstanding blade! Good offensive minus / Offensive blade. A not so blade: Not so fast (but enough speed for an OFF blade), not so stiff and not so hard. Price reasonable and good quality blade. The blade is excellent for mid to close distance players like me. It gives excellent control and also produces great top spins. I would also like to thank table tennis 11 team for making it such a wonderful shopping experience. The blade was timely delivered and was in excellent condition. Best online store for table tennis products. The blade has great control very good spin, has a good speed. But not the fastest blade out there, very light . Overall the blade is solid but since it is 5 ply, it lacks power. if you use tenergy or tensor rubber it will be good. Mine was 82g and was super solid. The edge is still fragile as to all stiga blades but this one doesn't dent too much as to offensive series. It gets the job done in the end at a good price. This must be the best looping all wood blade. It is made of soft wood but does not feel soft in short game which makes for great touch. When u add some power all of sudden the blade becomes soft and feels the ball goes in very DEEP. Creates feel of comfort and security. I used to play with a carbon blade (XIOM Stradivarius aramid carbon) and changed for Stiga Infinity VPS V and my game changed a lot!!! I can have the same power (or almost) but with much more precision! This blade is very controllable and powerful! I am an experienced (advanced club level) Cpen player in the past and has just taken up the challenge of learning to play shakehand. The Infinity VPS is actually my first real shakehand blade and it's a good choice for the developing player and for professionals alike. The pros of this is that it's very good for close to the table, two winged looping attack style. I have a steady FH and BH loops and drives/blocks (I use to play with RPB with Cpen) and this blade is particularly well suited on the BH for blocks/punch blocks. The spin and speed is everything expected of a 5 ply blade (I would rate it as a steady off speed) and as Stiga suggests it's a tad faster due to the coating used on the surface layers. The short game is also above average (I have tested several other "classic" shakehand wood blades prior to purchasing) and it's pretty good at opening up a backspin ball especially for me on the BH side. I recommend this for everyone who plays close/mid distance from table. It does lack a bit of speed far from table but I am not at a level to play like 4-5 topspins far from table like the pros so this is not really a problem for me. The only real downsides are: I have already bought two Infinity VPS，the first one was like around 78g and the second was close to 85g. This is a problem typical of Stiga blades (I have 6 Stiga blades so I do like them despite this!) and I recommend you ask the tabletennis11 people, they are excellent at finding and sending you a racquet with your desired weight. Second downside is that when changing rubbers I found the old rubber did take a little bit of the surface material (like stringing bits of wood). I recommend a little bit of lacquering (although Stiga doesn't for this blade I think) or else take care when gluing and removing rubbers. Also an extra 5/5 to Tabletennis11 for their service, I have bought literally like nearly a $1000 worth of gear from them, have never regretted it. This is first time I am so satisfied with a 5 poly blade. Good control and speed. Make you settle in your game. Powerful weapon. The quality of this blade is better than I expected, and the weight is what I am asking for: 88 gram. 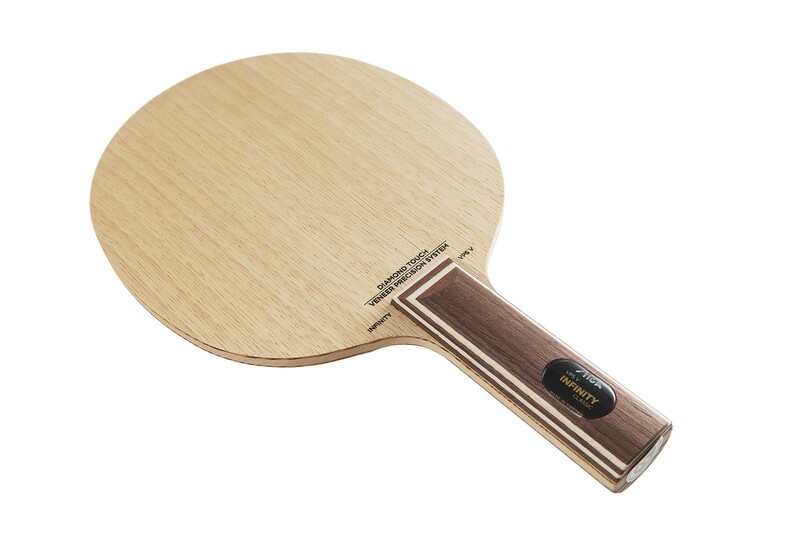 It has a different feeling than other 5ply wood blade: sharp and hard, similar to some carbon blade. Faster than many 5ply wood blades. The best thing about this blade is back-hand defense. The stiffness increases the successful rate a lot, and gives you opportunity to regroup and play rally against opponent. Infinity VPS V is a very nice blade. It is OFF, is a little stiff, and has high control.... 5 plies, 85g... I like it very much ! tiene un exelente equilibrio entre velocidad y control. good feeling to play, all in all you deserve to have one! !